It seems simple enough: Buy a fridge (or reuse an old one), put it in out in the garage for convenience, and plug it in. Right? Not so fast. There are a few conditions you need to be aware of that will affect the performance of a garage refrigerator freezer. Mostly, though, the best refrigerator for a garage will depend upon the temperature in your garage. Is Your Garage Too Hot or Too Cold? The main problem arises when your garage is not insulated, and susceptible to the drastic temperature changes of the seasons. Most refrigerators are designed to work inside a home, where we tend to keep the temperature moderate — usually between 60-85ºF (give or take several degrees for personal preference). Out in your uninsulated garage, however, temperatures can fluctuate from sub-freezing temperatures to blistering heat, depending on the climate you live in. When it's particularly hot, say 100ºF or higher, your fridge will have to work extra hard to keep everything in it cold. This will result in extra wear and tear on compressor and other components, and may result in a shorter lifespan. In the other extreme, when temperatures go below 38ºF — especially below freezing temperature (32ºF) — the fridge may not even do any work at all. Which might lead to the freezer section thawing out, and other problems. How will you know if your fridge can handle the right temperatures? Don't simply trust the marketing and leave it up to the manufacturer to tell you that the fridge is “garage ready” for YOUR garage. Always check the Owner's Manual when considering a refrigerator for your garage. You can usually find the owner's manual on the manufacturer's website for free. Why would the freezer thaw in colder temperatures? Well, most refrigerators have one thermostat, in the fridge part. When the temperature there gets too high, air is sucked out of the freezer section bring it down. Then, the compressor (the noisy motor in the fridge) turns on to keep the freezer frozen. When it's already cold enough in your garage, the fridge doesn't need need to work to keep the food inside cold. So, it never turns on the compressor, thus, never freezing the freezer. So, the freezer section becomes more like the refrigerator section, which isn't cold enough to keep things frozen. In freezing cold temperatures below 32ºF, the problem flips. It's cold enough to keep everything frozen in the freezer. However, this means that the refrigerator section is ALSO frozen. Items like fruits or vegetables that you don't want turned to ice will now be ruined. Additionally, garage refrigerator freezers will be insulated better against extreme temperature changes. This keeps not only your food and drinks cold, and your ice frozen, but also keeps the electrical components at consistent operational temperatures. Here's an odd recommendation I found on various sites around the Internet. If you live in truly extreme weather conditions (sub-freezing temperatures, or heat above 110°F), have an uninsulated garage, and it's too expensive to insulate the whole thing (or you are constantly opening the garage door), you might want to consider sealing off a small area just for your refrigerator. 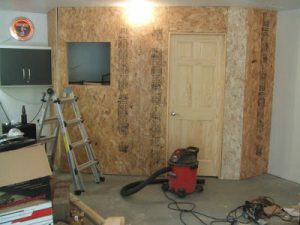 It could be as simple as a small plywood shed inside the garage that's just large enough to contain your fridge, with a little extra space for air circulation and a heating or cooling device. A little insulation wouldn't hurt. The important thing is that you keep the ambient temperature around your fridge in the operational temperature range. It's much easier to do this in a small shed than in your entire garage. In extreme heat, you'll want a cooling device for your refrigerator room, like a small garage air conditioner. In freezing temperatures, you'll need a [easyazon_link keywords=”small room heaters” locale=”US” tag=”3goodones-20″]heating device for a small room[/easyazon_link]. Maybe something as simple as a hot light bulb in some cases. I know, running an extra appliance with your fridge sounds like it will be extra expensive. But remember, you only need to bring the temperature around your fridge up or down to just within the operational temperature range (not to the temperature you keep your home at). You can even plug your heater/cooler into one of [easyazon_link keywords=”thermostat controlled outlet” locale=”US” tag=”3goodones-20″]these thermostat controlled outlets[/easyazon_link], so that it kicks on only when the space is above or below the recommended operational temperature range. Some people mistakenly believe that they need to buy an “outdoor refrigerator” for their garage, because being in the garage is kind of like being outside. But, the classification is slightly misleading. Fridges designated to be “outdoor refrigerators” are those that are approved by the Underwriters Laboratories (UL) as weatherproofed against wet weather. They are designed to be used outdoors in warm to moderate climates, not cold to freezing weather. 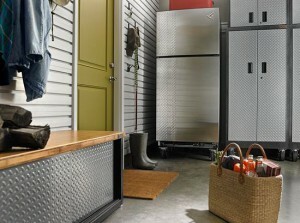 Garage refrigerators are not weatherproofed against wet weather. They are designed to work indoors, protected from the weather, but in the colder temperatures of an unheated, uninsulated room, like a garage. 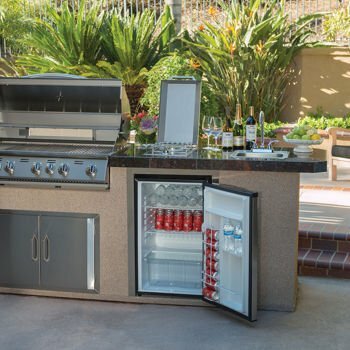 Read more about outdoor refrigerators here. So, while it IS possible for people living in moderate climates to just buy a fridge and put it in their garages for extra convenience, others will have to consider the temperature conditions of their garages first. People living in climates with particularly harsh winters will want a garage refrigerator freezer that will still keep their freezer items frozen when temperatures go down, and items in the refrigerator section just above freezing when temps go down further. I hope this article was helpful in your search for the best refrigerator for a garage. If you're looking to purchase refrigerators for garage use, you can read some of my reviews of garage refrigerators here. If you have any questions, or even comments about your own experiences with garage refrigerator freezers, please add them below. All I can say is because of your article I have saved a LOT of money. So, a big THANK YOU! Hi Scott, this is very helpful information as I was considering putting a freezer in the garage for extra food storage. I live in a moderate climate area but with the changing weather it has started to get a lot colder in the winter months. I will take your advice and purchase a garage ready freezer. Yes, I guess “global warming” is having an effect on our Winters the last few seasons. The extra drop in temperatures will definitely effect how our refrigerator freezers work in the garages. I’m glad you found this information helpful. Thank you for sharing more tips on choosing right fridges. I learnt something from your post. Just have a question for here. I’m from Brisbane, Australia, where it’s never too cold in winter, and has 300+ sunny days a year. We always keep a bar fridge in garage so anyone can grab a drink anytime they are in garage. 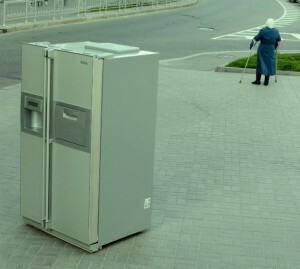 The little fridge is ordinary one which you would keep in bedroom. any advise on how can I keep it in good conditions? I have to admit I’m a little jealous of your climate! It sounds like your small refrigerator might be fine — it doesn’t sound like it gets excessively cold or hot in your fridge. Some basic maintenance will be enough to keep your refrigerator in working order. Checking the temperature occasionally, wiping it clean inside and out, dusting off the coils in the back, and making sure the door seal is not damaged. Here are a few tips for maintaining your refrigerator. I live in the tropics and most of us have our refrigerators in the kitchen (and no where else) so this article is very interesting to read. I suppose people in my region take things for granted as we don’t need to worry about changing the fridge according to the weather climate. Recently, my fridge broke down and in less than 6 hours, all our food went stale. We had to ‘rescue’ them by asking kind neighbors to lend us some space in their fridge to keep them fresh. Yes, in tropical weather, a fridge can be quickly turned into an oven if it stops working! The insulation will eventually work to lock the heat IN instead of out. Thanks for reading and commenting, Cathy! are separate refrigerators and freezers the best option (ie freezerless fridges and fridge-less freezers) in a garage? However, you’ll still have to consider operational temperature range of the appliances. Be sure it’s designed to work at the various temperatures you experience in your garage, and that the insulation will keep your food and drink at an even temperature inside, as the temperature fluctuates in your garage. If my garage gets too cold and the compressor cuts off can I install a heating element (150 watt bulb) somewhere near the unit that will stop this? This is actually a very similar solution to the Garage Kit I mention in my other article, 3 Good Refrigerators for a Garage. You want to be sure that, not only does the compressor not shut off, but that the fridge is insulated properly. Another thing to consider is if you have a dedicated circuit in your garage for the fridge or freezer. Most units need 8 amps of power on circuits that are typically 15 amp capacity. So if you’re sharing a circuit with a fridge, freezer, and power tools, lights, etc. you could cause issues with the functionality of all of the above. Very good point, Dan. I hope this will help other readers looking at buying a refrigerator/freezer for their garage. My kitchen goes through temperature swings in the summer – up to 95 degrees and more. Would a garage-ready refrigerator be a good choice indoors? The one I have now can change from -10 to 20 in a few hours. Also, when the kitchen is cooler, the freezer tends to go up. I need it consistently around -8 to -5. “Garage-ready” tends to refer to a refrigerator that can operation in a wide range of temperatures. While we often think of our garages as “outdoors”, they really are indoor environments, protected from most of the elements except for temperature. A true “outdoor refrigerator” holds up to a different set of standards. So, yes — I think a garage-ready refrigerator would be something for you to consider. Is the unit installed with enough space around it for air circulation? You usually need a couple inches of space along the sides, back, and top to allow for air to circulate around the fridge and for the compressor to work. If it’s installed in a tight space or a cabinet/closet with no space for air circulation around it, that could be preventing it from cooling down properly. Is the freezer stuffed to capacity? Is there room for air to circulate inside the freezer? This is also important for proper functionality. Have you been opening it frequently, or putting hot/warm things into it? These things immediately raise the temperature inside the freezer, and it will take a little time for the compressor to bring the temperature back down to normal operating range. If you decide that you need a different unit, while you do your search, check the manuals and installation instructions as I mention in the article above, and check the operating temperatures. Many will say your kitchen can be as hot as 110˚F (sometimes higher), and your fridge will still operate properly. Good luck with your search, and please come back if you have more questions, or to let us know what you picked out! You never said which refrigerator/freezer will work in a really cold garge. I have a whirlpool that does not keep items frozen in really cold weather. I saved that information for another post: 3 Good Refrigerators for a Garage. Keep your eyes open for another post, coming later this week! When I bought my refrigerator for the garage, I was told it was a garage refrigerator. Years go by and never really worked right I finally called Frigidaire and they told me it is not a garage refrigerator nor can it be adapted to be one. This is a really annoying thing since my frozens are melting and my fridge stuff is freezing. I’m sorry to hear you are one of the victims of this misunderstanding. I hope the information here is helpful for your next purchase. You can also find some good search strategies for your next garage fridge on this article. Would it be OK to unplug the fridge for the winter and plug it in come spring? My wife just bought a used refrigerator for our garage. We live in Tucson Arizona and the temperatures for 4 to 5 months hit 100 degree;s plus outside. I imagine that it will be hotter in our garage due to no circulation. Will this work and will our electricity bills go up dramatically. 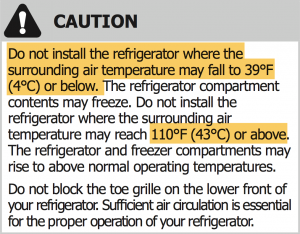 I recommend you find the manual for the fridge online. (Most manufacturers keep copies on their websites.) Check the operating temperature (usually in the “Installation” section of the manual) and see if the Arizona heat falls within the right range. You’ll get a sense of whether your fridge can handle working in the heat long-term. Now, regardless of the ideal operation temperature, however, the hotter it gets, the harder your fridge will have to work. The harder it works, the more electricity it will need. I cannot say how much more it will use, but again, the manual or specs from the manufacturer may give you a better sense. I hope that helps. And, thanks for reading and commenting! OK, I understand why refrigerators aren’t efficient in a cold or hot garage. Manufacturers, please figure this out. 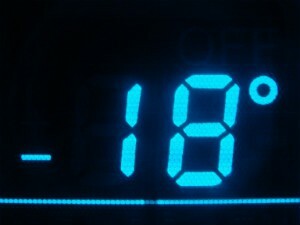 You have heating and cooling available so figure out how to keep a water valve in a garage refrigerator from freezing. Also, please keep the compressor cool in hot weather. Hi there: We are thinking of purchasing a small 5 cubic foot freezer for garage.. We live in NJ..
My question is should we have to buy a freezer that is garage ” friendly” too? I understand about the considerations for fridges in garage, but how bout just stand alone freezers ? Thanks much.. And keep up the information dissemination! Hi, Bootsie (love that name!). You’re right. Stand-alone freezers won’t have the same issues that a combo refrigerator-freezer will. Check out more at this article here. Don’t overthink it. Set each section to the temperature you need it to be for what you have inside! That’s the advantage of having the two independent thermostats.